I knew the Sea Chanters would be good. They're a unit of the U.S. Navy Band, so excellence was a given. And if I was going to expend the effort to drive an entire 33.5 minutes to see them in Rock Island, Ill., they'd have to be good. 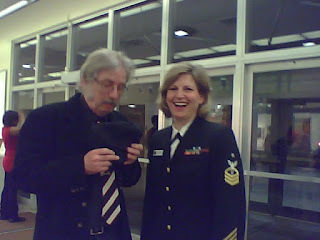 I'm a former fleet bandsman, and I'd been blogging for days about my typical fleet bandsman's love-hate relationhip with the U.S. Navy Band. To keep this old MU happy, the Sea Chanters would have to put on a hell of a show. of crude carping about the Navy's premiere musical units. Their performance in Augustana College's packed Centennial Hall moved brisky and hitchlessly, alternating choral numbers with songs and medleys by smaller vocal groups and soloists. In fact, each member of the ensemble is a capable and professional solist. They had everything. Props. Sets. Choreography. Broadway tunes, pop songs, oldies and newies, all delivered with enthusiam. And pacing. The performance flew by until, after perhaps an hour, the leader, MUCS Georgina Todd, addressed the audience,stressing that the U.S. Navy Band sends units like the Sea Chanters to remind America of the professionalism of its Navy. Then they let loose the musical guns of patriotism and fired away until the audience was on its feet. Including me. I admit it: I was enthralled by the Sea Chanters. Don't get me wrong--I haven't changed my mind about the professionalism of the Navy's fleet bands. There's nothing second-rate about them; they're top-drawer units, every one, and I'm proud to have served in them. The Sea Chanters are as good as any musical unit in the fleet. I'm going. 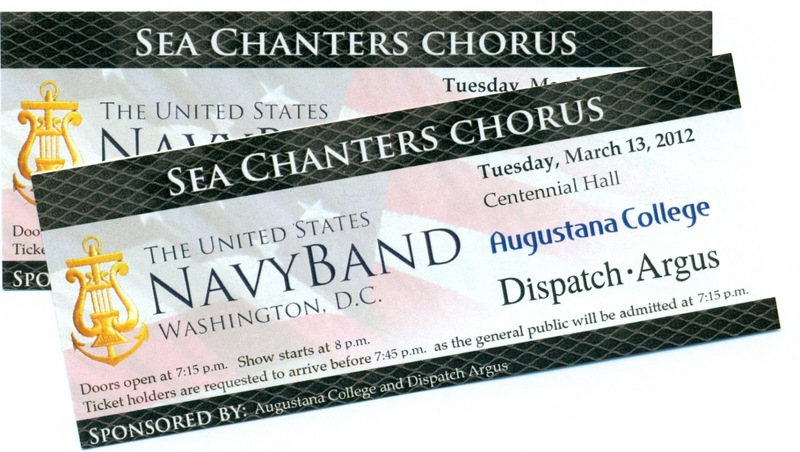 Tomorrow night, my wife and I will drive up to Rock Island to see the Sea Chanters in concert at Augustana College. Perhaps my earlier announcement was less than clear. I do not doubt the musical excellence of this group. The U.S. Navy Band and its units have always been excellent. Point is, I'm a fleet musician. I know how hard a fleet MU works to make his way to Musician First Class--there are no giveaways. And I particulary know what it takes for an MU1 to make Chief. I did it, and it wasn't easy. In those days, the results came out annually: 5 MU1s promoted to MUC, and 4 of them were from the Navy Band. In a big year, 7 MU1s were promoted to MUC, 6 of them from the Navy Band. I absolutely understand Tim Foley's high regard for members of the U.S. Navy band and the hard work they do (see his comment to my earlier post.) Coming from a fleet MU, Tim's obervations mean a lot. But fleet MUs work hard too, and they don't get chevrons and chief's anchors handed out to them like Mars Bars and M&Ms on Halloween. I am very aware that not all members of the U.S. Navy and Naval Academy bands walked in off the street. Many members of special bands have fleet experience. I maintain ongoing, treasured relationships with shipmates who were accepted into one of the special bands. But I wasn't. Call me biased, if you will. The fact is, they wouldn't take me; not that that's any reason why I should feel the way I do. Certainly not. No way. Negatory on that. Actually, I was sort of transferred to the Navy Band in 1977 for a tour that lasted approximately three hours. 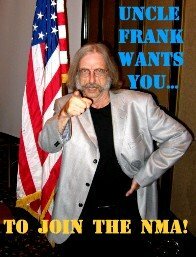 I won't tell the story here--it is necessary to name names--but the tale got good reviews in the lounge last year at the NMA reunion, and I'd be glad to reprise it, names and all, in Orlando. Come on down.